Thanks to the kind generosity of H.R. 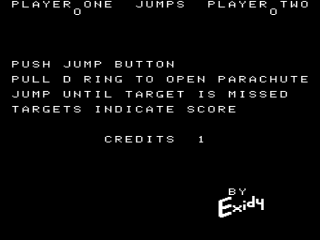 Kaufmann, president of Xidy, the original ROM images for Rip Cord have been made available for free, non-commercial use. 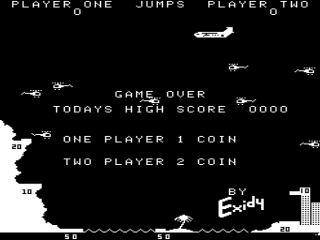 Rip Cord was another black & white game released by Exidy in 1979. It was designed and programmed by Arlan Granger. 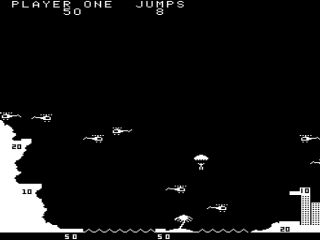 The goal of the game is to jump out of the plane and land safely on one of the many targets down below. 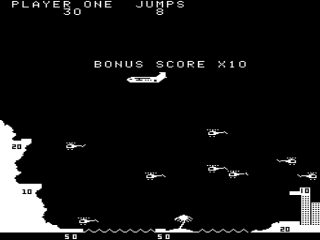 The challenge is to avoid the numerous enemy helicopters that occupy the sky in between your plane and the ground. 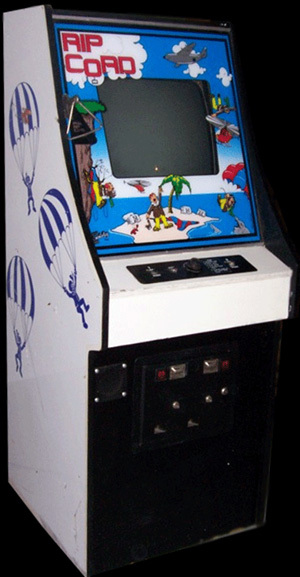 You control the timing of your jump with the Jump button, at which point your parachutist begins hurtling toward the ground out of control. Pressing the D-Ring button shortly afterwards releases the chute and slows your descent. More importantly, it allows you at this point to control your left/right position via the paddle control to help you avoid the enemies.